I'm not writing this in order to commend Kingsley's poem, but just because it's fresh in my mind and hopefully someone else will one day want to compare notes. I don't think it's even a quarter as interesting as The Saint's Tragedy, and it eminently deserves the understated dressing-down that it gets in Adrienne Auslander Munich's Andromeda's Chains: Gender and Interpretation in Victorian Literature and Art (Columbia University Press, 1989). Munich observes that the Andromeda legend appealed to a number of high Victorian worthies. 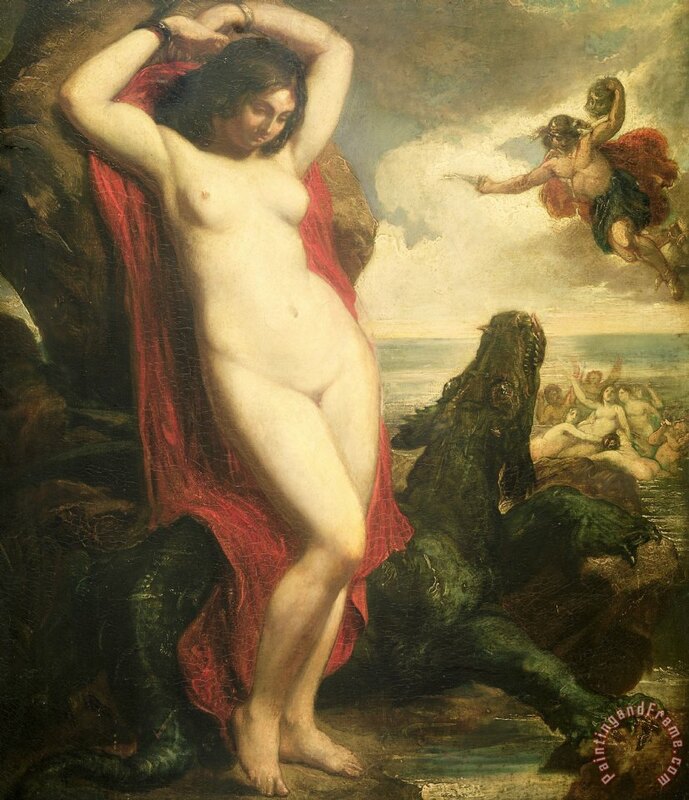 One of the other principal presences in her book is the artist William Etty (1787 - 1849), who painted Andromeda several times. Some of his other efforts are more exciting than the one I've chosen, but this one's interesting because of the bizarre disparity in size between the heroine and her approaching rescuer. (If you think Andromeda seems rather indifferent to the action unfolding behind her, this is no doubt to prevent her catching a fatal glimpse of the Gorgon's head.) In Kingsley's poem too the manly hero tends to be envisaged as something rather small, like a black-browed osprey*, or a swallow haunting the house-eaves, or a bee roving at will. On the other hand the imaginative centre of the poem is Andromeda's naked body in the chains: brass chains, Kingsley specifies; the softness of that body, drenched by sea-spray. Carved through the strength of the brass, till her arms fell soft on his shoulder. Once she essayed to escape: but the ring of the water was round her,.. In proper matrimony, of course. This is Kingsley after all. ...longing, and rapture, and chaste content in espousals. Heavy, enamelled, the flower of the gold and the brass of the mountain. Coral and sea-fan and tangle, the blooms and the palms of the ocean. The first time the line appears is when describing the midnight gambols of the sea-nymphs seen by Andromeda. The second time is when describing the fringe of a veil woven by Athene. Its effect is to make us pause and reflect on what the poem could have been, if it had been more concerted in its realization of a Homeric space, and less concerted in its effort to shape a parable. * He's right. 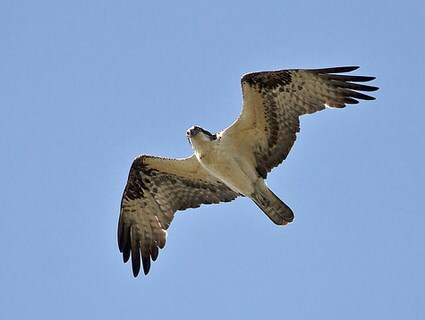 Ospreys do have black brows.